Eyes on the prize… A bald eagle keeps a watchful eye on the water near GRDA’s Pensacola Dam. 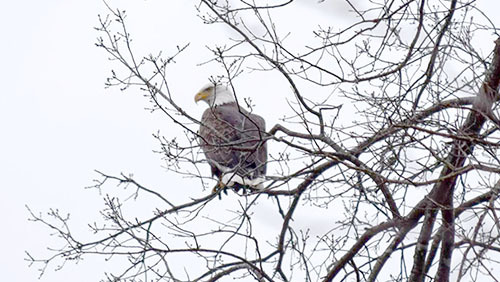 However, it’s also a great time of the year for visitors to put their eyes back on to the eagles. From mid-December through March, this area below the dam is a haven for the eagles as they hunt for small fish, often snatching them off the surface of the water, or even stealing them from other birds. The best time to watch the birds in action is early in the morning. 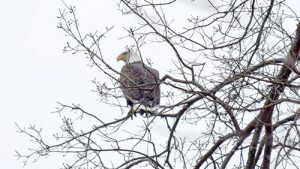 The location is a quiet spot for viewing the majestic American Bald Eagle (Hailaeetus leucocephalus) in the area; the only eagle unique to North America.